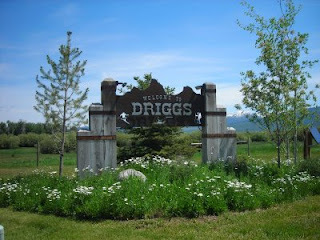 'Tis the season for visiting Driggs, and this is the new sign welcoming folks into town. The 4th of July is always peak visitation weekend, so next week will be busy. Hot air ballon rides, mountain bike races, arts & crafts, parades, community breakfasts and more. 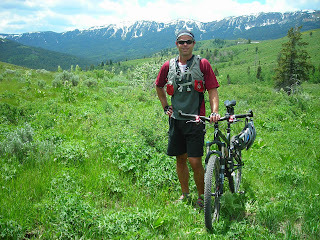 Teton Valley, Idaho couldn't be more beautiful at the moment. Visitors will be amazed at the green fields, kaleidoscope of wildflowers, and snow-capped peaks framing it all. It's been incredible to see the explosion of summer, and I've been getting out there enjoying it as much as possible. A couple of the year's first mountain bike rides, hikes with Bridger, turning on the pasture irrigation, bar-b-ques outside...we're now in full summer mode. With the Solstice this past weekend, the days are insanely long and activity-filled. This is the time of year you never want to end. 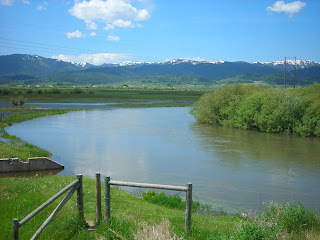 This photo shows the Teton River at Bates Bridge. It's not quite at "peak" level yet, but should be within a matter of days now. Lots of folks were out floating, kayaking and fishing on the river over the weekend. 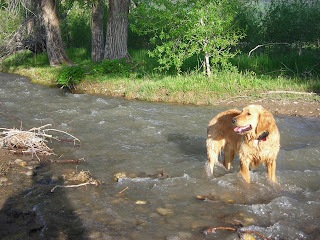 It's great to see high stream flows again, especially after last year's total lack of water. Speaking of visitors: my longtime buddy Kurt, Meg and their new baby girl Abby came all the way from the Bay Area and stayed with us this past weekend. It was great to see them, experience life around a newborn (yes, really), and catch up. 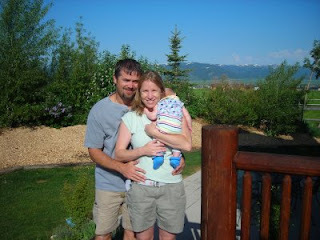 They are stellar parents, and I'm predicting Abby will grow up to be some kind of Rhodes Scholar or Olympic athlete. Kurt has the sweetest softball/baseball swing you'll ever see, Meg played college soccer, and they are so bright our house is still glowing. Thanks for spending a couple days here in Driggs, guys. It's been a while since I posted a picture of Bridger. So, just to let you know he's doing O.K., here you go. He's a crazy as ever, and with the onset of summer he has become a water and shade-seeking machine. As much as we're enjoying the warmth, I think he'd still prefer snow. We'll agree to differ, for now.